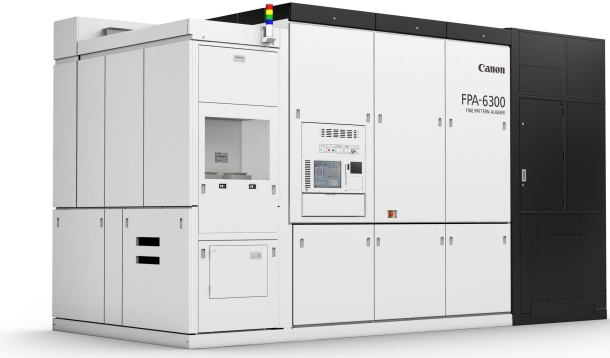 TOKYO, April 5, 2012—Canon Inc. announced today that the company has commenced sales worldwide of the new FPA-6300ES6a scanner, a lithography tool employing a KrF excimer laser*1 light source for the high-volume production of memory, logic and image-processing devices. Amid ever-growing demand for computers, smartphones and other advanced electronic devices, demand for the semiconductors used in these products has also been on the rise, creating increased need for tools capable of delivering high productivity, precision, reliability and capacity utilization. In response to these industry needs, Canon launched the new FPA-6300ES6a, designed for the mass production of DRAM, flash and other memory devices; logic devices such as microprocessors for PCs; and color filters and other imaging sensors and image-processing devices. Based on technologies cultivated through the field-proven FPA-6000 series, Canon’s new FPA-6300ES6a achieves high throughput and the industry’s highest level of overlay accuracy to effectively respond to the advanced needs of chip manufacturers seeking reduced Cost of Ownership. The FPA-6300ES6a employs highly sophisticated stage-control technologies, an improved alignment scope and precise temperature control to make possible an overlay accuracy of 5-nm,*4 the highest level within the industry. Additionally, it offers an advanced NA 0.86 projection optical system and a wide range of options to support demanding and robust device production.